Whole world is witness to your ancient story…. Sacrifices of great heroes, will be remembered for long…. A special assembly on the topic Unity in Diversity was conducted by the kids of K.G Jupiter and K.G Uranus. It was held on 10 December, 2015. Parents of the children were cordially invited for the event. The programme began with a sweet welcome note by two children followed by a group song, “Hind Desh Ke Niwasi”, on the theme ‘Unity in Diversity’. India and its culture has always been an attraction and a mystery to foreigners. 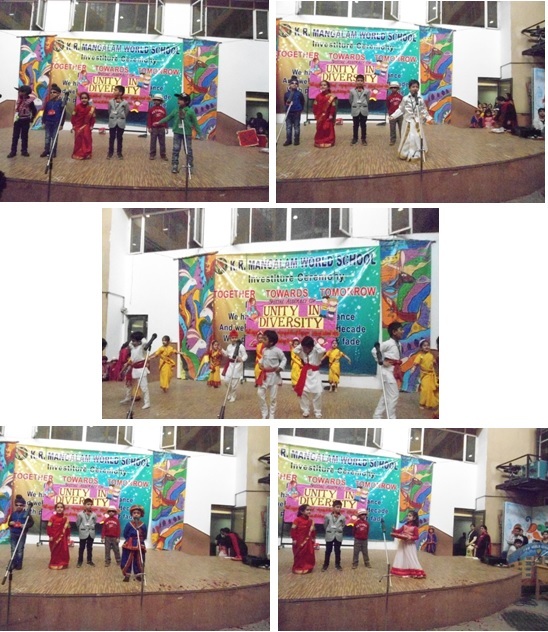 Such, was the topic of our skit related to diversities in culture in India, namely, ‘Unity In Diversity’. It showcased three foreigners coming to visit an Indian family and to see various places all over India. Flawless dramatization and perfect dialogue delivery made the skit a perfect hit. Dance performances in between the skit made it all the more enthralling. The assembly culminated with National Anthem, sung by children, parents and teachers altogether in glory to our country. All in all it was a show, praised and appreciated by all.